According to Bloomberg’s report, Apple has kept on lowering the buy-in fee for its iAd mobile advertising by reducing package prices for main advertising companies from the original buy of $1 million down to $300.000 in some deals. 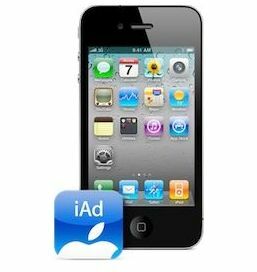 Apple and its iAds mobile advertising service are the target of a new lawsuit from a company that owns a patent related to location-based ads. Apple was named in the lawsuit from StreetSpace, along with Quattro Wireless, which is now being phased out in favor of iAds. 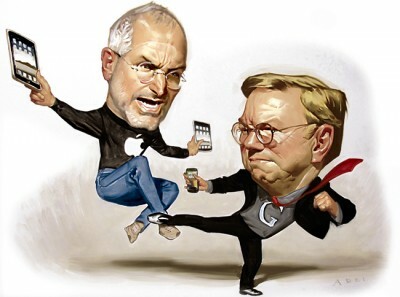 Other defendants include Google, AdMob, Nokia, Navteq, Millenial Media and Jumptap. StreetSpace is the creator of a remote Internet terminal the Web Station. Users can walk up to one of these terminals to access the Internet, and are delivered targeted advertisements in the process. The suit alleges that iAds service, launched on July 1, is in violation of StreetSpace patent because it delivers personalized advertisements based on a user's location, profile and usage history. Related to that invention is U.S. Patent No. 6,847,969, which StreetSpace has alleged Apple is in violation of. Named "Method and System for Providing Personalized Online Services and Advertisements in Public Spaces," it was granted on Jan. 25, 2005. 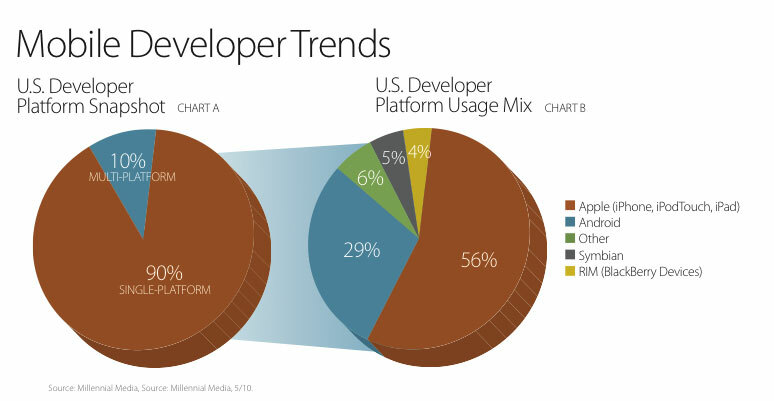 According to Mobile Mix Survey, conducted in May by advertising agency Millennial Media, 56% of all developers in the USA write software for Apple’s mobile platform iOS. This is almost as twice as more than Google’s Android developers. 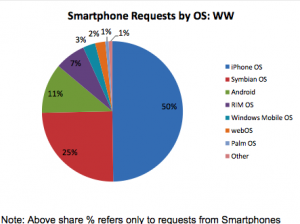 5% goes to Nokia’s Symbian and 4% of devs work on software for RIM’s BlackBerry OS. But there are more surprising facts unveiled in the survey. Nielsen revealed the results of a new poll of 11,734 U.S. users that claims Apple is the No.2 smartphone maker with 28% market share of mobile devices, thus gaining 2% in compare with the previous quarter. 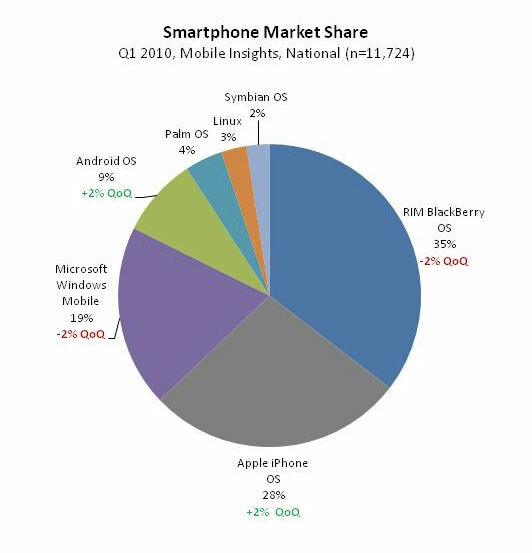 The biggest share belongs to Research In Motion, which has 35% with its Blackberries. Other smartphone makers are showed on the pictures below. It is interesting that study reveals most of the Android and iPhone users are male, and Android users are younger, less educated and less wealthy. If only 28% of Android users earn $100,000 every year, there are 40% of iPhone users that have the same income. 34% of all smartphone users have six-figure salaries. "These unique device numbers are from the AdMob network only and reflect the adoption of our products and business operation. 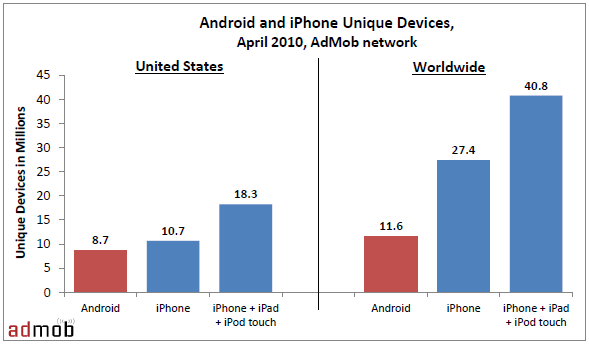 We don’t know what percentage of the total universe of iPhone and Android devices AdMob reaches. However we believe the data is useful on a relative basis given the large sample size of devices in our network." Recently Billboard published a report that reveals new information on Apple's share on music sales market. When the first generation iPhone was presented, iTunes had only 12,7% of American music market. In 2008 Apple almost doubled it and made 21,4%. 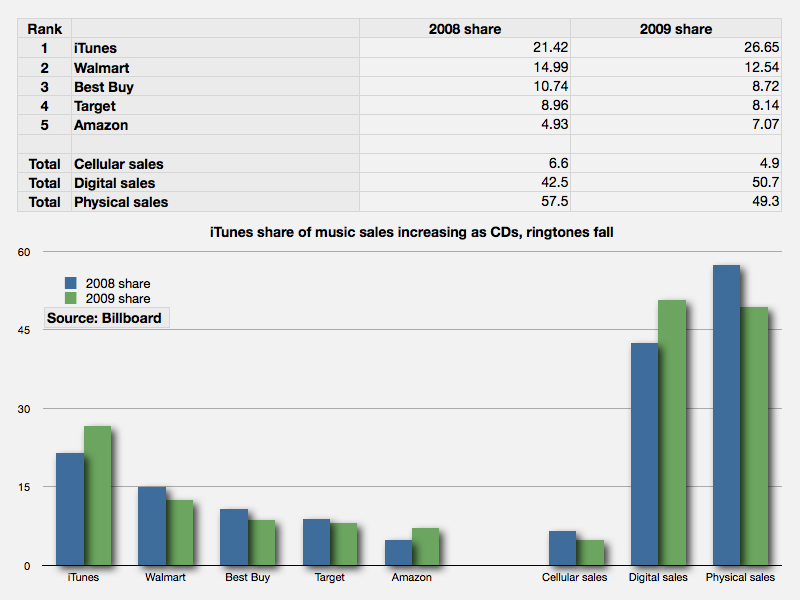 2009 reveals five percentage points increase - now iTunes has 26,7% of music sales. Such mobile providers as AT&T, T-Mobile, Sprint, and Verizon Wireless on the contrary lose their positions, downing from 6,6% to 4,9% in 2009. Partly it is explained by lower priced ringtones in iTunes and its free tools for making custom ringtones. Both of these factors eventually attracted more people. Physical media music in turn loses its popularity from year to year. Numbers reveal its share fell from 57,5% in 2008 to 49,3% in 2009. That means that iTunes actually makes a half of all digital music downloads overall. iTunes' closest rival Amazon also increased its sales. But in digital MP3 sales the company's share grew from 0,8% in 2008 to 1,3% in 2009, which is not even close to Apple's 26,7% share. Such results, according to Billboard, were "still well short of where major labels had hoped Amazon's download store would be by now, dimming earlier expectations that it will be able to significantly reduce the labels' heavy dependence on iTunes for digital sales." It is interesting to look forward for Google which recently acquired Simplify Media to expectedly turn it into iTunes rival for Android users. But for now the company's subsidiary AdMob reveals the amount of media bought or even downloaded by Android users is still so small that it cannot be compared with iTunes success. According to TechCrunch, Wireless Quattro had recently contacted iPhone app developers to introduce their new "Verification of iTunes Purchase" program. The company is an Apple subsidiary,and it currently develops forthcoming iAd program. "Verification of iTunes Purchase uses no SDK or server-side integration — this cannot be duplicated by any of our competitors". Other advertisement companies such as Google's AdMob can only estimate conversion rates, but such data cannot be as precise and detailed as Quattro's one. For enabling conversion tracking every developer that uses AdMob must integrate the company's advertising API into his code. 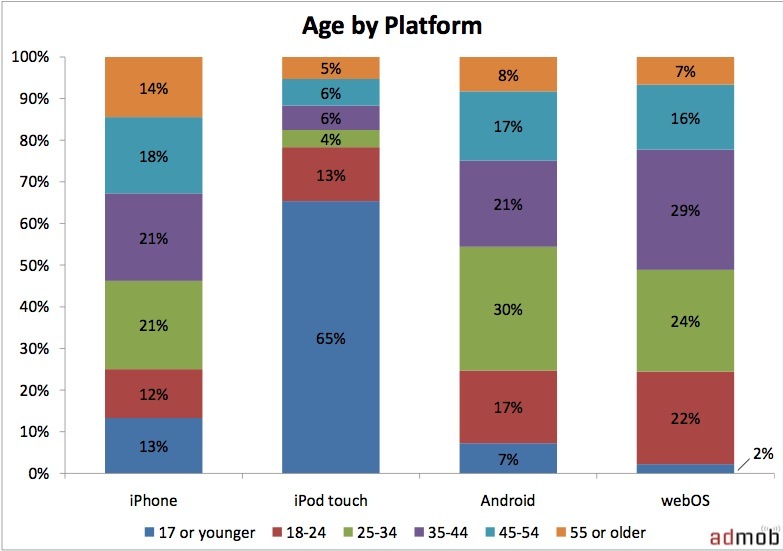 iPod Touch is for kids? An interesting fact was revealed by Admob Mobile Metrics when they ran an opt-in surveys on iPhone, iPod Touch, webOS and Android devices to understand how they are engaging and interacting with applications. As you see on the photos below, it becomes obvious that iPod Touch is more popular for teenagers. Moreover, as latter are mostly supported by their parents, they use these devices differently, and that is why the number of free downloads is so high for iPod Touch users. Apparently, iPods make a high profit to Apple, but is this so because of children? AdMob has released their latest October 2009 October Mobile Metrics report with details on devices and platforms requests ads from AdMob network. 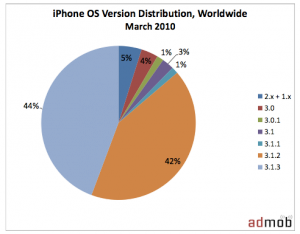 The iPhone and iPod Touch platform (iPhone OS) has a comfortable 50% share of worldwide traffic and 55% of US traffic. 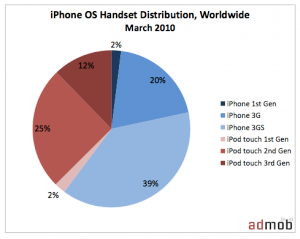 In terms of top handset models, Apple’s iPhone accounted for 22.4%/24.1% (up 5.5%/5.2%) and iPod touch for 9.8%/11.4 (up 1.4%/2.3%). Apple nearly reached the milestone back in May when it hit 49%, but the company's share temporarily dropped back over the next several months before beginning a sharp climb again in September. You can read the full report in PDF here. AdMob, a company that supplies advertising services for iPhone developers, says that between September 15th and 22nd only 23% of devices were updated to iPhone OS 3.1. This counts only devices that run apps with AdMob ads. 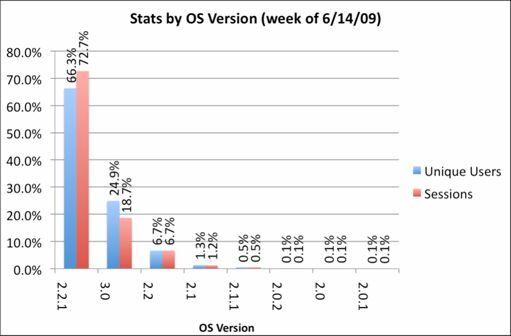 Some more statistics: 51% are still running OS 3.0, and 19% are still running v2.2.1, while 7% are still running v2.0 or earlier. The reasons, as always, are very different. The update for the iPod Touch costs money, there are problems with internet tethering in 3.1, there is no firmware 3.1 jailbreak tool for Windows and it is impossible to jailbreak iPhone 3GS. Have you perfomed the upgrade or not? Please, leave a comment why. AdMob published it's June report, showing detailed statistics about smartphone market. As for iPhone 54% of iPhone OS devices are currently in the US; however, this number has slowly declined from 61% in the last six months, implying that international users are growing faster than those in the US. Following the US, the United Kingdom, Germany, and France each have over 5% of users. 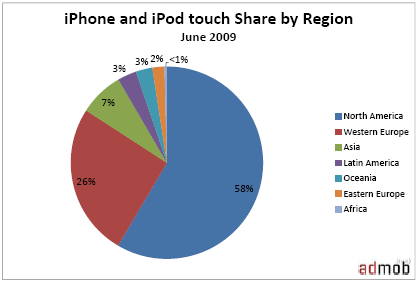 As a region, Western Europe has a 26% share of iPhone and iPod touch users. Based on Apple guidance, the company has shipped 26.4 million iPhones and approximately 18.6 million iPod touches to date. 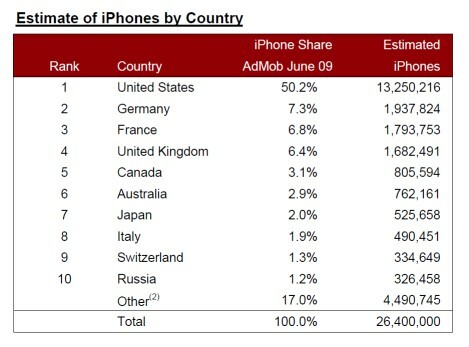 We just posted statistics from AdMob about firmwares on iPhones and iPods. Here are the numbers from another company - PinchMedia. This company deals with monitoring the use of applications. 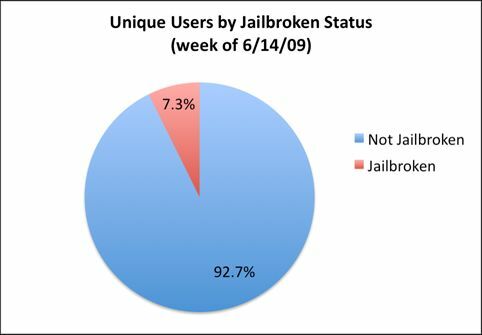 7.3% of iPhone and iPod Touch owners performed jailbreak.